My Country Roads: Wild and Wonderful : She thinks it's a hat.. etc..
She thinks it's a hat.. etc.. But it's the bag for her rubber duckies.. This is my husband's gift for me during our wedding anniversary this year together with a dress. Thanks Hon! What a nice anniversary gift. I'll bet you get a lot of use out of it. Hello Mommy Ross, my first time to post for photo hunt nakita ko kay pinaymama at nagustuhan ko ang style. I like your bag at ang sweet naman ni hubby ^_^ Trick or treat!!! Hi, Baby is very cute and already inventive! The bag is pretty and will suit sporty and elegant, anyway when has a girl ever enough bags or shoes? Thank you for stopping by. Yes, goldfish are nice creatures they like to be fed, do not bite and never talk back!! Cheerio T.
Darling little pumpkin! And that bag (gift) from your husband is gorgeous. Hahahaha don't blame the kid bakla, blame it to the company who produces that kind of stuff, well it looks like spidermans hat waaaa. 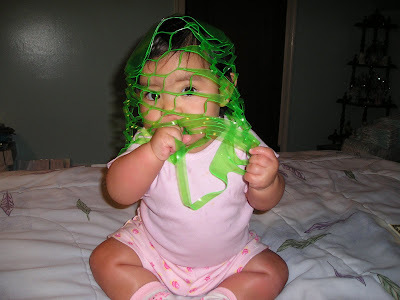 Rylie looks like a green spider baby hahah just kidding. Good one bakla, loving it. and nice bag.. so sweet of hubby..
what a cute little angel! that is one nice bag. you just gotta love kids! John has good taste. Ganda ng choice nya! Pwede mahiram? COngrats to you little girl. She deserve it becuase she have the sweetest smile like her parents..
congrats to rylie! 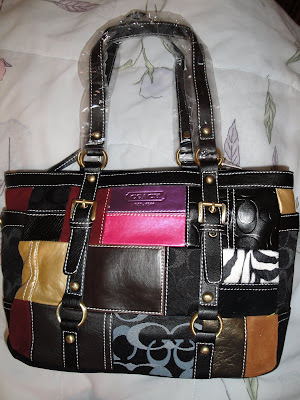 love the coach bag!!! Ka sweet talaga ng Honey mo, wahhhhh! Bakit ako di nireregaluhan ng Honey ko..daya ah..Inggit ako dun! Hehehe. Nice purae.